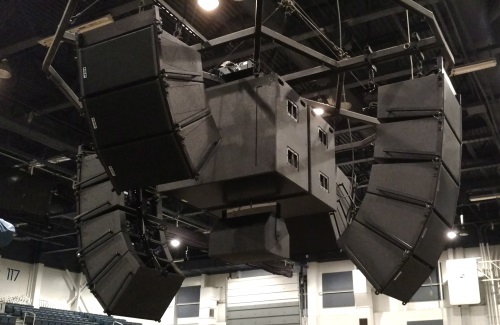 An interesting conversation from the PSW Live Audio Board (LAB) forums on the advantages and disadvantages of hanging subs with line arrays. By “time of flight” I meant the distance of travel and the subsequent loss in SPL associated with that. Sufficient numbers is the KEY word. If you are going to hang subs, you will need a few more than if they were ground stacked. This is why I am not a fan of systems that include subs in the same hang as the mains. There is typically not enough and they just don’t come together the same. I think it has been studied before ( and I can’t remember by whom) that when it comes to subs and full space, it is of moot consideration. The problem is the locality of the listener in relation to the subs. The listener is always on a ground plane. A ground plane is an infinite baffle for all intents and purposes. This means any energy presented will load up on it. You can put subs 100-feet in the air and it won’t matter. The sound will come down and you will hear the resultant effect of the direct and reflected sound off the ground. A small comb filter perhaps, but you will still have the effect of coupling from your vantage point. What you hear will always be 3db louder than what the actual source contributed. I suppose if you were 100-feet in the air with the subs while listening to them, then you could more realistically factor the whole space sound of subs. When subs are hung they more evenly cover the area because the lobe is rounded off at the ends of the hang. This adds lots of energy in the center of the hang and it tapers off at the top and bottom. Since no one is typically above the subs, the front rows experience roughly the same output as those in the back rows who are in the direct plane of all the subs and experience the coupling of all that energy. The power alley and all the other lobing effects are still there, but with some clever beam steering and tuning, the nulls can be placed in aisles and the focus of energy can be very much directed where you want it most. I am particular to ground stacked subs myself more because you get a little more mileage out of the subs ( don’t need as many ) and you can play with arrays and deployments that can really make magic happen. I suppose the best deployment would be a combination flown sub array with some well placed and aligned ground stacked units as well. With subs there really is no magic bullet though. It is always a compromise. Ground stacked subs are just easier for the average sound provider to deal with. When you are doing large shows with real line array systems, flown subs is just the logical option. Many line array/constant curvature systems have subs that are designed to be a part of the main hang. Just about all the vendors offer a system where subs can be integrated with the mains. These are the system types I am not fond of. It just doesn’t work right to me. I would not find hanging a single sub in your application to be worth the effort or loss of trim. We have the inventory to hang 6/side subs and it absolutely makes a big difference in coverage when you can do it right. Typically directly behind the main array on its own rigging. And in combination with floor subs as well. But if hanging on the same point as the mains, the loss of trim, and for us, the decrease in the number of line array boxes we can use with the subs makes the trade off not worth it. In your case if you can put up three or four subs per side on separate lifts behind the array, great. If not, it isn’t worth the hassle. Click here to go straight to this forum thread to ask questions or add comments. The Best Place To Put Subwoofers Is… ?